Note: The link to the website 'Dave Gilmour's Guitar Equipment' is not shown because it is currently unavailable. These are no longer available new from Roland. You can only purchase the CS-3 which (to my ear) does not sound as smooth as the CS-2. (B) Pro Co. Rat II Distortion. The first generation Rat's distortion, filter & volume knobs yield various Marshally distortion tones. Pete Cornish custom Big Muff. (looks like Pete has taken an original Big Muff and housed it in a custom box). I don't know if this has been modified in any other way. (D) Boss GE-7 Graphic Equalizer. This GE-7 has been set to be used in conjunction with the Rat distortion pedal. This is obviously a Pete Cornish custom effect. Notice the combination of the GE-7 graphic EQ sliders & the knobs for sustain & volume. (F) Sovtek Big Muff II. The Big Muff is a very heavy-vibed fuzz with volume, tone & sustain controls. The muff sounds huge & powerful despite it's feeble tone control range & is looser & more gargantuan than say a Pro Co. Rat II. (G) Chandler Tube Driver #2. The Tube Driver offers lots of tight girthy gain and has an openness that sets it apart from other distortion boxes. Features high/low EQ, tube drive & output controls. These later became known as Tube Works Tube Driver. The Dynacomp has a natural sounding expansion & a nice bright tone to it. No longer available new from Roland. (K) Chandler Tube Driver #1. The Tube Driver offers lots of tight girthy gain and has an openness that sets it apart from other distortion boxes. Features high/low EQ, tube drive & output controls. This later became known as Tube Works Tube Driver. (L) Boss GE-7 Graphic Equalizer. (M) Boss GE-7 Graphic Equalizer. (N) Boss GE-7 Graphic Equalizer. With Dave Gilmour's rack system we meet a marriage of technologies, old & new. He has always exhibited a preference for older, analogue effects but has had Pete Cornish create a switching system which guarantees ease of use with optimum, low noise performance. (A) Furman PL-8 Power Conditioner And Light Controller. I can only guess that this controls the lights on top of the rack so Dave can see the pedals. (B) TC. Electronics TC-2290 Dynamic Digital Delay + Effects Control Processor. This is Dave's primary delay unit. He uses this on most songs. The Uni-Vibe unit featues volume & intensity controls, a chorus/vibrato switch & sepearate speed controls for the slow or fast speed options. It also requires a seperate foot switch pedal for fast or slow. Gilmour does not use the chorus option! This effect was originally a footpedal, however Gilmour had his longtime technician Phil Taylor make a rack system out of it. He even had the old logo embossed on the face plate of the new rack. (D) Digitech IPS-33B Super Harmony Machine. (E) Lexicon PCM-70 Digital Effects Processor. Dave uses the PCM-70 to store the circular delay sounds you hear in Shine On & Time. Because it has a multi tap function it can pretty accurately duplicate the kind of echo Dave used to get from his old Binson echo unit. (F) MXR Delay System II. 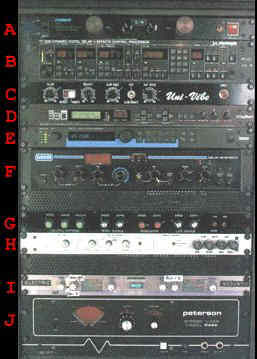 This is another rack system that began life as a footpedal. Phil also added a digital readout that he says is really nowhere close to being an accurate indication of delay time. (G) Phil Taylor Custom Rack. This is yet another custom made rack from footpedals. It contains the following effects. The original chorus from Boss has rate & depth knobs & sounds sweet, rich & dynamic. There are two CE-2's loaded into this rack one is marked Mono Chorus & the other Left Chorus. (The left chorus is inserted in the signal path for the left channel of Dave's amp setup). The Electric Mistress has rate, range & colour controls, plus a filter matrix switch. This is sort of a bizzarre sounding flanger that gets extremely detuned & twisted. The Tremulator has speed and depth controls. (H) Dynachord CL5222 Leslie Simulator. (I) Samson UHF Dual Receiver. There are a few footpedals & other items which are not pictured or part of Dave's current live rig but have been and still are used by him in the studio. This was MXR's first effect and only has a speed knob that yields complex, swirly phase textures with silky highs & lots of vocal inflection. Also does decent rotating speaker imitations at higher speeds. The classic of classic fuzzes sounds big, deep & bad. The Fuzz Face takes you from clean to insanity with a mere twiddle of your guitars volume knob. An 80's classic Gilmour used on About Face (notably at the end of Murder). It delivers incredibly gutsy grind & tons of deep bass boost. Features low/high and colour mix controls. The Maestro Rover looks like a late 1950's NASA satellite (I will try and get a scan of this thing) but it's a rotating speaker designed to go between your guitar and your amp. This sure fire attention getter has amp & instrument inputs & features volume, speed, slow & fast controls. A crossover routes the upper frequencies through the Rover's amplifier to the rotating speaker, while the lower frequencies are sent to your stage amp. This Bob Bradshaw designed pedalboard is used to select individual or different preset combinations of effects. This doesn't do the actual switching though. The left side of Dave's rack unit contains his Pete Cornish custom built switcher, which has 24 sends & returns & uses gold plated relays to turn individual effects on and off. In addition to this, it also sends standard MIDI program numbers to the various MIDI processors that are contained in his rack (such as the Lexicon). It can also send almost anything he wants to the rack, such as a delay time or whatever. I'm not sure if he uses any of these features, but it's there. For information on a similar type of pedalboard designed by Rocktron/Bradshaw. This seems to be a switch Dave uses to toggle between electric & acoustic setups. Selects the bank number for preset sounds. Selects which speed the doppola's rotate at. Selects the speed of the Dynachord CL5222 Leslie Speaker Simulator. Selects the speed of the univibe rotating speaker simulator. (10) Ernie Ball Volume Pedal. Despite the apparent complexity of Dave Gilmour's set up, the actual contents of each track may come as something of a surprise. Essentially his sound is fairly clean, choosing different distortion units to add their characteristic sound to his signal. As an example, to reproduce the track Money from Dark Side Of The Moon live in concert, Gilmour uses this effects combination. Main Riff: Pete Cornish Soft Sustain with Chandler Tube Driver #2. Solo: Boss CS-2 Compressor with Chandler Tube Driver #1, Sovtek Big Muff & TC Electronics digital delay. After journeying through the rack system the signal meets an alembic F2-B bass guitar preamp. This has been modified with an extra tube, lowered output impedance & a different capacitor to help cut the low end. Gilmour has always been a fan of Hi-Watt amps, tending to use AP-100 watt heads on stage and combo's in the studio. Live three of the heads are used as power amps & another three are used as slaves. All use Mullard E-34 valves which are desperately difficult to get a hold of these days, but Floyd head of backline Phil Taylor still has a cupboard full! (A) Right channel output to 4x12's 1+10 8 ohm. I am guessing that (1+10) refers to channel inputs on a mixer i.e. channel 1 left, channel 10 right. (B) Left channel output to 4x12's 2+9 8 ohm. Again (2+9) could be channel 2 right, channel 9 left. If this is the case then Dave could have, for instance, channels 1+2 as a stereo pair for the Marshalls & channels 9+10 as a stereo pair for the WEM's. (D) Output to Heil Voice Box via Pete Cornish Dummy Load Box 8 ohm. (E) Output to Doppola's 87, 88 8 ohm. (F) Output to Doppola 89 8 ohm. The right channel Hi-Watt powers a WEM 4x12 which is loaded with Fane Cresendo speakers and a Marshall loaded with Celestion speakers. A second Hi-Watt does the same thing for the left channel which also carries a chorused signal from a Boss CE-2 Chorus. (See Footpedals Incorporated Into A Rack Space). In the second rack, one AP-100 feeds the Jim Dunlop Heil Voice Box, another feeds Doppola's 87 & 88 (8 ohm) & a third feeds Doppola 89 (16 ohm). These rotating speaker units were designed by Phil Taylor & Paul Leader to provide Gilmour with that 'Leslie' effect on his guitar. Leslie cabinets themselves might have seemed the obvious choice, but Gilmour was after a slightly different sound. In the studio he had been using Maestro Rover units which are revolving full range speakers but they are too low powered for live use and so the Doppola's were born. Three units are used on stage each loaded with two six inch 100 watt drivers. (A) Marshall 4x12 cabinet with Celestion speakers. (B) WEM 4x12 cabinet with Fane Cresendo speakers. (C) Custom Doppola rotating speakers. Posted by d_l_m on Sat, 03/16/2002 - 22:11. Does anyone know anyhting about the switcher that is controlled by the Bradshaw pedalboard??? Where can I get a switcher? Are they easy to build??? Any help or advice would be appreciated! Posted by John on Sun, 03/17/2002 - 21:04.
: Does anyone know anyhting about the switcher that is controlled by the Bradshaw pedalboard??? Where can I get a switcher? Are they easy to build??? Any help or advice would be appreciated! I believe the router is made by Pete Cornish. TC 2290 (David's delay on his rack) for sale!!! Posted by Dan on Thu, 03/14/2002 - 03:31. I can't afford it, but someone as dedicated to Gilmour's sound as I should purchase it. I wish I could! Re: TC 2290 (David's delay on his rack) for sale!!! Posted by KEN on Mon, 04/26/2004 - 02:38.
: I can't afford it, but someone as dedicated to Gilmour's sound as I should purchase it. I wish I could! Posted by KEN on Mon, 04/26/2004 - 02:44.
: : I can't afford it, but someone as dedicated to Gilmour's sound as I should purchase it. I wish I could! : WHY IS HE SELLING? SOUNDS LIKE A RICK THE LIAR STORY TO ME. Posted by the squirrel on Wed, 03/13/2002 - 17:13. FENDER Strat MEX '60 Classic-------> is this a good guitar ? Posted by Farley on Tue, 03/12/2002 - 05:31. I'm thinking of switching my guitar from GHS boomers to Ernie Ball medium gage to get a more classic feel and sound....good idea?!? Need tips for maximizing my dynacord CLS-222 leslie sim. Posted by Gstring on Sat, 03/09/2002 - 21:22. This popular thread has been given its own page : Need tips for maximizing my dynacord CLS-222 leslie sim. Posted by sebastiano on Thu, 03/07/2002 - 15:57. Posted by Juan Fernandez on Fri, 06/27/2003 - 18:43. COMPRO. INTERESTING ECHO BINSON ECHOREC. Posted by ulatek on Thu, 03/07/2002 - 06:06. Does anyone here know which modes/scales gilmour relies on when playing lead? Posted by Manu Duran on Fri, 03/08/2002 - 17:43. If you want to study hard the use of this kind of scales and modes, I recommended the "Frank Gambale technique book -Book one", from DCI Music Video - Legato publications". Posted by Manu Duran on Fri, 03/08/2002 - 17:33. Posted by the squirrel on Wed, 03/06/2002 - 16:39.
is a fender mexican strat that bad? Posted by Chip on Sun, 10/05/2003 - 09:14. Are the strings any close to the fretboard on the USA strat? Posted by Chip on Sun, 10/05/2003 - 09:15.
: Are the strings any closer to the fretboard on the USA strat? Posted by numbed on Wed, 03/06/2002 - 18:50. Posted by gilmourdude on Thu, 03/07/2002 - 01:13. The mex strats are not bad guitars by any means. I had a few of them and just recently bought an American standard. I like the American better though. The hardware is higher quality. The bridge is stainless steel. It feels better and in my opinion sounds better. Either one is fine though. Posted by John on Wed, 03/06/2002 - 11:51. I only need the solo parts. If you have them please cantact me, I am putting together a Back track Cd and so far have over 64 minutes of Floyd Backing tracks. Posted by John on Wed, 03/06/2002 - 11:53.
: I only need the solo parts. If you have them please cantact me, I am putting together a Back track Cd and so far have over 64 minutes of Floyd Backing tracks. Posted by Leo on Wed, 03/06/2002 - 21:16. Posted by Adam on Tue, 03/05/2002 - 23:23. The other day I went out and bought a pack of medium strings... The guy looked at me and asked "Are you sure you want string that are THIS THICK!?" and I was like "uhhhhhhh, yeah" and then when I went to go get a replacement at another shop the guy asked me the same thing "Are you sure this is the right size? This looks really thick!" So what's the deal with everyone using light strings? Wouldn't medium be the choice? Afterall it's MEDIUM! Posted by numbed on Wed, 03/06/2002 - 04:34. Posted by Chris Failla on Wed, 03/06/2002 - 02:12. Could you tell us the string gauges? Posted by joan on Tue, 03/05/2002 - 13:38. I´ve heard that the turbo rat is way better than Rat2. That you can get same sounds as Rat2, but way more fuzzer if you want. Have anyone tried Turbo Rat? Posted by Clayton Kolb on Sat, 04/27/2002 - 02:17. The turbo is basicly like the Rat2, but with a hell of a lot more output. Posted by johnsson on Fri, 09/12/2003 - 07:34.
yeah..but can you tell us what is the main difference between vintage rat and rat2/turbo rat? Posted by Don on Tue, 03/05/2002 - 12:01. What chorus should i buy? I don´t want Boss Chorus cos´ i already have few boss pedals and I don´t wanna be any kind of " Boss dude". My other effects are Boss Ds-2, Roger Mayer Classic Fuzz and EHX Echoflanger (It´s mix between Electric mistress and clone theory chorus). Posted by ulatek on Tue, 03/05/2002 - 06:25. Posted by Renato on Wed, 05/15/2002 - 11:52. + Equalizer + Electric Mistress (Flanger) > Fender Strato and Ampli Fender. Posted by Dan on Mon, 03/11/2002 - 22:24. Try using the Boss dd-3 and a second delay pedal...play around with them. It's much cheaper. Posted by John W. on Mon, 03/04/2002 - 11:52. Posted by numbed on Mon, 03/04/2002 - 05:30. Posted by matt on Tue, 09/06/2005 - 06:27. It depends whether he's playing chords or single notes. If it's single notes he uses his fingers. If it's chords he uses a pick. Posted by joe james on Fri, 03/08/2002 - 04:56. I learned it by fingerpicking and it's pretty easy if you practice. If you can do hey you then it shoudn't be that hard. Posted by Floyd on Mon, 03/04/2002 - 21:55. Posted by steve-O on Wed, 12/19/2007 - 09:25.
you bet me to it...i was gonna say the same thing...dave didnt play it..but..its all finger picking...nice song to play. Posted by Bob on Sun, 03/03/2002 - 23:28. Posted by Bob on Sun, 03/03/2002 - 23:23. Posted by filmour on Sun, 03/03/2002 - 00:44. Please, help me! i need to know the best order and setting for the Big muff (or Rat? ), mistress and Phase 90 (ok for Dynacomp, chorus and delay...) to emulate comfortably numb as in "Is there anybody out there?" (live Wall). And what about amp equalization? Help me! Help me! I have a concert! Posted by Floyd on Mon, 03/04/2002 - 00:51.
: Please, help me! i need to know the best order and setting for the Big muff (or Rat? ), mistress and Phase 90 (ok for Dynacomp, chorus and delay...) to emulate comfortably numb as in "Is there anybody out there?" (live Wall). And what about amp equalization? Help me! Help me! I have a concert! Posted by Mark on Thu, 02/28/2002 - 21:26.
anyone know what type/brand/size strings Gilmour uses on his Jensen lap steels ?? Posted by gilmourdude on Fri, 03/01/2002 - 01:17. Posted by paltza on Thu, 02/28/2002 - 15:03.